There's always going to be problems when developers are able to set anything they like on Steam with no proper checks from Valve. 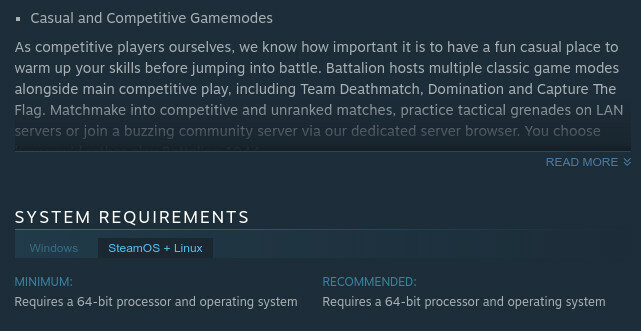 Despite listing SteamOS/Linux system requirements and showing a SteamOS icon, BATTALION 1944 [Steam] is not coming to Linux. For the record, I value what Valve has done for Linux gaming. Their continued effort behind the scenes with VR work, Mesa and so on is awesome. However, that doesn't give them a free pass from criticism when I think they need to step up a bit. Notice it's on my wishlist—sigh. More importantly, the SteamOS icon to indicate Linux support. Specifically note, the SteamOS + Linux system requirements. The game has been showing up like that for quite a long time now. As it turns out, it's not actually coming to Linux with the Early Access release today (or at all). I posted on their Steam forum to ask them about it back on October 9th, 2017 which never got an answer from the developer. Since then, I've made a reddit post, a post on their official forum, emailed them twice and sent probably 10+ tweets to ask them about it. I also tried their Discord, they didn't reply to a PM there and their actual normal chat was just—terrible, no chance of an answer there due to the types of people that inhabited it. After the above, I wasn't too amused to see only server files being mentioned and no client. Today, we finally have a real answer. I managed to get their Lead Programmer to answer on Twitter, to confirm it is not coming to Linux. I'll be honest, I'm quite sad and annoyed about this. I was very excited by the game myself, but it goes to show that you should never just trust what the Steam store shows. What I will say, is do not give the BATTALION developers a hard time over this (especially since they didn't take pre-orders, so no one has lost money through Steam in this case). They still should have noticed what they had done, but ultimately it's not their store. Their communication was still poor though, they should have done better. I'm using them as an example to highlight the issue, but they're certainly not alone in this. This is not the first time it's happened and I've no doubt it will happen again, until Valve has some better verification in place to make sure games on Steam are actually coming to the advertised platforms. This is where GOG does better. Even though they end up with less games, their attention to their store is a lot better. Valve, if you're reading, this sort of thing shouldn't happen. Please do better. Ps. Day of Infamy is a good WWII shooter and supports Linux. there still at fault for keeping that there for quite a while.getting people's hopes up for a linux port and now it's not gonna happen.they should of told valve to remove the icon but they didn't.so both parties are at fault.i left a comment telling them i would of bought the game if they had linux support and that they should of had the icon taken down.bad business practice on there part. First time hearing about this game and now won't give it a chance. I'm not looking forward to an overly saturated WW2 shooter market again. After seeing that, Id rather play Day of Infamy. Sorry. So it turns out they were working hard these last months..that nobody could type "No" to any of the messages/mails (for some reason I picture them in a basement with chains in front of the computers with no internet access) ..and they made a mistake with the icon because of the server files..this is irresponsible..to say the least..
And yes.. valve has to do something with the "icon" thing..because as it turns out nobody can trust developers nowadays..
Hello! I'm new here I just wanted to comment on this title not coming to linux. I'm super disappointed but I'm glad to be part of the linux community and I appreciate all the efforts put forth here. I look forward to more disappointments...j/k Super glad to be here! t3g After seeing that, Id rather play Day of Infamy. Sorry. TBH despite it's aesthetics, it's really nothing like DoI. It's a competitive 5v5 with short rounds, so more like Counter-Strike. Quote Good news Linux fans! Are you talking to linux fans? Pathetic. I suggest you ask one of you windows fanboys to run dedicated linux server so other windows games can play your game. No one around here is interested.